Figure 1. Exponential Hermite Snake at initialization. Figure 2. Exponential Hermite Snake after convergence. This software implements an active contour (a.k.a snake) constructed with new exponential B-splines inspired from the cubic Hermite splines. It provides a direct control over the tangents of the parameterized contour, which is absent in traditional spline-based active contours. The new basis functions have been designed to perfectly reproduce elliptical and circular shapes, which makes the model well-suited to outlining blob-like objects. V. Uhlmann, R. Delgado-Gonzalo, C. Conti, L. Romani, M. Unser, "Exponential Hermite Splines for the Analysis of Biomedical Images," to be presented at the 39th International Conference on Acoustics, Speech, and Signal Processing (ICASSP'14), Florence, Italy, May 4-9, 2014. We introduce a class of active contours built using a novel kind of exponential B-spline basis functions. The snakes family that stems from them have two main features that make it well-suited to the analysis of bioimages. Firstly, it is built using two complementary basis functions, a construction inspired from Hermite interpolation that grants direct control both on the curve and on its tangent field. Secondly, it has ellipse-reproducing capabilities. Our model actually uses the shortest possible functions that have the Hermite property, satisfy the partition of unity, and reproduce ellipses. Active contour algorithms consist of two steps. The snake is first initialized by the user, and then the curve is made to evolve on the image through the optimization of a cost functional (or snake energy). In the present example, the snake energy can be tuned to be attracted to edges or ridges. 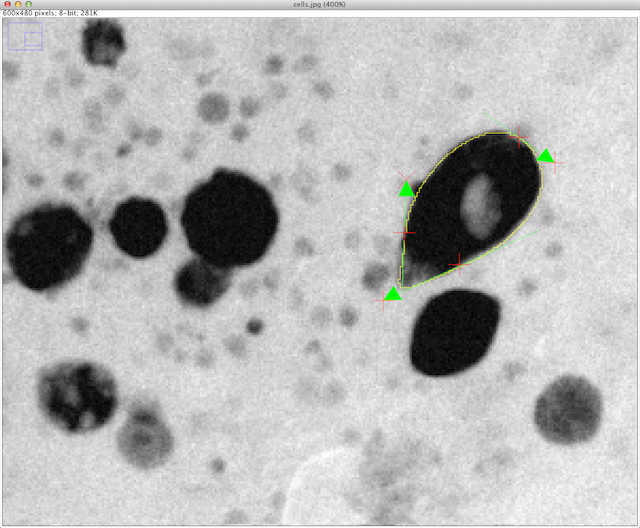 To install the plugin download the ExpHSnake.jar file and put it in the plugins folder of ImageJ (ImageJ/plugins/). The Exponential Hermite Snake plugin also requires some external libraries that have been regrouped in the following archive file. The archive should be uncompressed, and the elements it contains should be placed into the jars folder of the plugins folder of ImageJ (ImageJ/plugins/jars/). Figure 3. ExpHSnake settings window and open image. If a ROI is present in the image, the Exponential Hermite Snake will try to use it as a initialization. Otherwise, the snake is initialized as a circle with evenly spaced anchor points in the center of the image. The Exponential Hermite Snake can then be manipulated thanks to a revised set of tools from ImageJ's toolbar, which we discuss below. 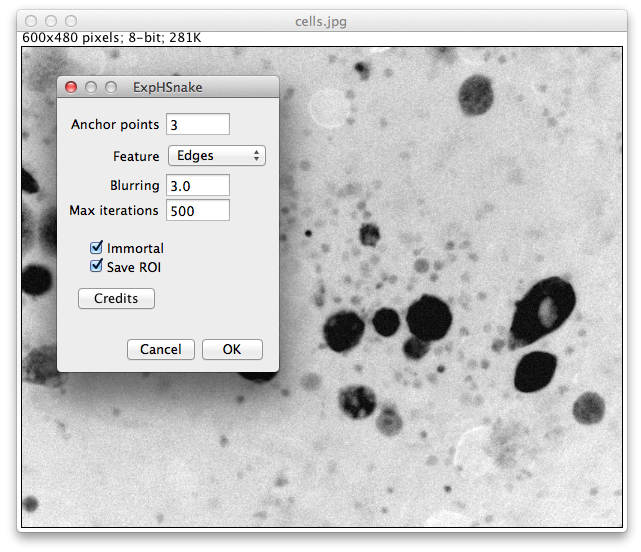 ImageJ's toolbar is restored as soon as the Exponential Hermite Snake Snake dies or is killed. To select a point, click anywhere in the image. The point closest to where you clicked will be highlighted. To move points, drag within the image. The point closest to where you clicked will be moved to the position where you release the mouse. Alternatively, you can use the keyboard arrow keys to get a finer control over the position of the points; for this to work, the image window must be frontmost. The latter manipulations are possible with anchor points on the curve as well as with tangential controls. Note: in any case, it is not possible to interactively move a point outside of the image frame. Figure 8. Tool to launch the optimization. Figure 9. Available tools during snake optimization. The 'stop' button (a black square) is used to manually abort the optimization. If hit, the resulting snake will be returned in the state where it achieved the most favorable configuration so far during the course of optimization. If left to its own devices, the snake will converge to some (possibly local) optimum. Figure 11. Tool to leave the ExpHSnake plug-in and adding the ROI to the ROI Manager. This tool is used to gracefully return to ImageJ adding the ROI to the ROI Manager if selected in the settings windows. Figure 12. Tool to leave the ExpHSnake plug-in without adding the ROI to the ROI Manager. 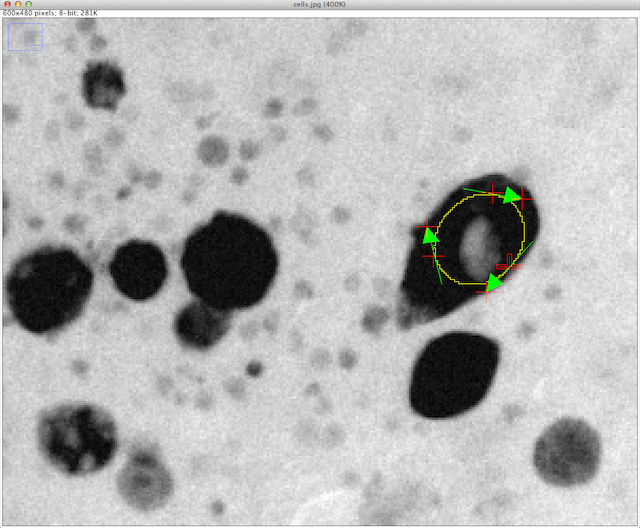 Like the previous one, this tool is used to return to ImageJ, but without adding the ROI to the ROI Manager.